If you have an undeniable love for all things maple, then learning how to make maple sugar should be one of your culinary expertise. 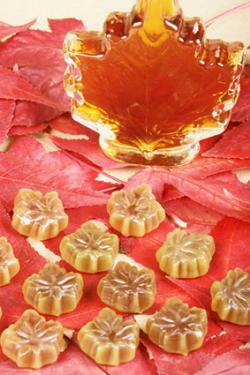 While making maple sugar isn't a simple task, it is incredibly tasty and will last in your pantry for a very long time. Maple sugar is what is left over after boiling sugar maple tree sap once all of the water is boiled off. However, you do not have to start with tree sap - you can start with pure maple syrup. Making granulated maple sugar is not difficult to make so long as you have a bit of time on your hands. It also doesn't require a lot of special equipment. Pour your syrup into the heavy-bottomed sauce pan. Turn your heat on medium-high and wait until the syrup starts to boil. Once it starts boiling, begin stirring constantly. As you boil your syrup and it looses water, the consistency will change and begin to form a sort of foam. It will puff up and then go back down again quickly when you stir it. Continue to stir consistently so that you don't burn the sugar. Once you see this change in consistency (from syrup to foam), lower the heat to low. Continue stirring until you have granules. Once you see granules, move your sugar into your other pan off the heat and continue to stir and break up any clumps. If you want a darker sugar, you can leave it on low heat until it's completely granulated. To use the sugar as you would in tea or coffee, you may want to pass it through a kitchen sieve. Cedarvale Maple Syrup Co. notes that one gallon of syrup produces about eight pounds of sugar, so you should get approximately one pound of sugar from the two cups in this recipe. Crunchy maple sugar is a somewhat hard, crunchy, molded maple sugar that is made by heating the syrup to about 28 or 30 degrees F above the boiling temperature of water, which will differ according to your altitude above sea level. At sea level this temperature is approximately 242 degrees F.
Once the sugar has boiled to this temperature, immediately turn the temperature down to allow it to cool to about 150 degrees F, and stir continuously until it has reached a plastic consistency. Finally, pour the sugar into molds to settle and harden into candy. Soft sugar candy is made by heating syrup to about 32 or 34 degrees F above the boiling temperature of water, and then immediately pouring it into a flat pan and allowing it to cool, without stirring, until it reaches about 200 degrees F. The candy is then stirred until it is soft. Finally, it's poured into molds. The candies usually set in about 30 minutes. Add it to your oatmeal in the morning. Stir a teaspoon into your tea. Melt it down and use as a glaze for meats. Sprinkle it on top of cookies or coffee cake for an extra burst of flavor. Be aware that substituting granulated sugar with maple sugar is not a one to one process. Maple sugar is much sweeter than regular sugar, so a little goes a long way.